Ever since Florian was a young musician, he has been exposed to a variety of cultures and musical traditions. Born in Sydney, he started the violin under the guidance of his Mother at the age of 5 just before travelling for 2 years throughout Europe and Asia, spending 7months in Indonesia playing in a traditional Gamelan Orchestra. 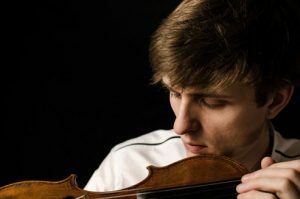 His Classical upbringing began in Helsinki using the coloured strings method under the famous pedagogue Géza Szilvay, before being accepted into Chethams School of Music in Manchester at the age of 14. He began the Conservatorium in his mother country Belgium, where he found that the Viola, a instrument he had enjoyed playing for years, was something he wished to give his full focus to. He chose to study with Leo DeNeve completing his Bachelor in Antwerp before moving to Berlin where he studied with Walter Küssner at the ‘Hans Eisler’ Hochschule für Musik Berlin achieving a Masters with the highest possible distinction. Ever since playing in a family Quartet as a child, Florian’s passion has been Chamber Music. He has played with a variety of fixed Quartets and ensembles performing regularly throughout Europe. He is a regular guest of the Open Chamber Music sessions in Prussia Cove, studied with the Artemis quartet at the Queen Elizabeth Chapel, and attended other Academies such as the Seije Ozawa Academy and the Mahler Academy. He is currently a member of the Boccherini Trio studying intensly with Rainer Schmidt and Hatto Beyerle. The group is a member of the European Chamber Music Academy and has permormed at the Wigmore Hall, with more bookings at the Konzerthause Berlin and Philharmonie Berlin to come. His orchestral passion was ignited at Chethams in Manchester, and has since played under many of the major conductors and soloist of our time, in halls like the Concertgebouw Amsterdam, Muziekverein Vienna, Royal Albert Hall, with orchestras including the Mahler Jugend Orchester, the Verbier Festival Orchestra, and the Berliner Philharmoniker. He spent 2 years as Principle of the Brussels Chamber Orchestra and until 2016 was Principle Viola of the Gürzenich Orchester Köln. As soloist and chamber musician Florian has also premiered a heap of contemporary music in a variety of festivals, halls, and Radio broadcasts. Other fields of interest include Conducting, Coaching, and Acting. During his time in Belgium he toured with the Production “Wanja”. Using only live contemporary chamber music, Florian interacted with his fellow actor/musicians fusing the roles of Musician, Actor and Puppeteer. The ground breaking production was aimed at young children and won in 2009 the ‘Jungen Ohren Preis’ for Best Children’s Music Theatre. Florian’s Solo activities have recently included performances of the Bruch Double Concerto, Mozart Concertante and Kancheli “mourned by the wind”. Florian plays on a modern Viola by Falk Peters, and has also an intense passion for photography.